5:30AM Set up the kettle with a aluminum pan filled with water and briquettes set up snake style around the bowl for a low and slow sesh. Lit 12 briquettes inn the chimney and dumped them on the left end of the trail of briquettes which we’re looking to gradually catch and provide steady even heat between 275-300 degrees. 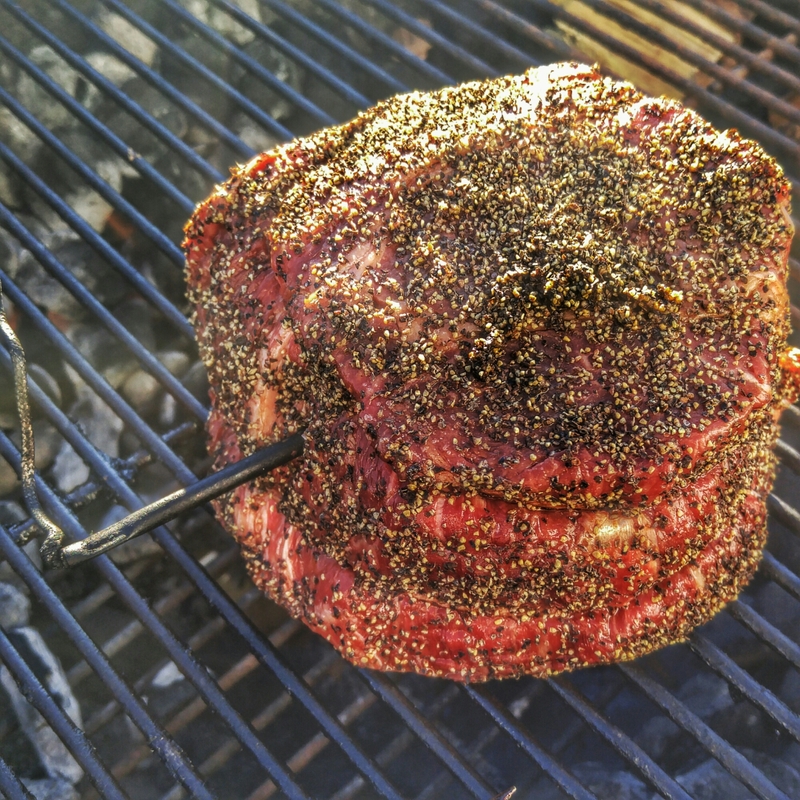 using cherry chips and mesquite chunks. I’m not sure if it’s just our local Stop and Shop market that pre-cuts the racks of beef ribs or if it’s done elsewhere as well. I buy what’s on sale usually and they had 2.4 lbs on sale for $2.24 per lb so I couldn’t pass them up (you can’t see the sale tag in the first picture). Slathered them up lightly with yellow mustard and applied a generous coating of coarse salt and black pepper (Texas Style rub). 6:24 The Beef Ribs Hit the pit. Most of us die hard BBQ fanatics cook all the way through the winter but if you haven’t fired up the pit it’s a good time to give your grill a checkup and a little maintenance to ensure you’ll be ready to rock come spring. I find it best to scrape down the grates right after you finish up and season them but there are many times you just want to get right into the delicious grub you just prepared so a little crud gets left behind. A little crud is no big deal in the summer when you’re cooking often but you don’t want that to stay there all winter making for a tougher spring cleanup. On a sunny morning even if it’s cold, start up the grill, let the grates warm up, scrape it down and then apply a nice coat of canola or peanut oil to the grates to protect against rusting. A tiny bit of preventative maintenance goes a long way to keeping your pit tip top shape! 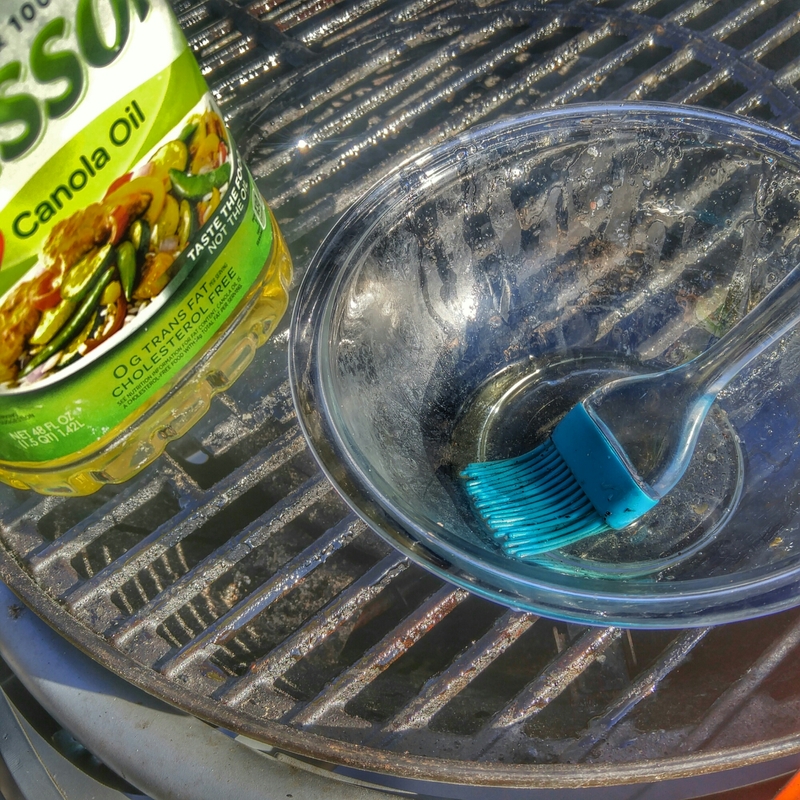 I keep a mason jar with canola oil next to the grill all spring/summer/fall but it will congeal in the winter. At the dollar store they always stock $1 silicone brushes which are great for mopping sauces and also applying oil to season your grates after every cook. Have a great day and keep grilling! Been absolutely jonesing to BBQ something for the past week. As usual I rarely go to the market with a pre-set plan. I look to see what’s on sale and then go from there. This afternoon Stop and Shop East Gloucester had some cut up pork shoulder, so I figured I’d smoke up some fake burnt ends. One of the many things I love about the STOK Charcoal drum is the included charcoal starter insert which eliminates the need for a chimney. 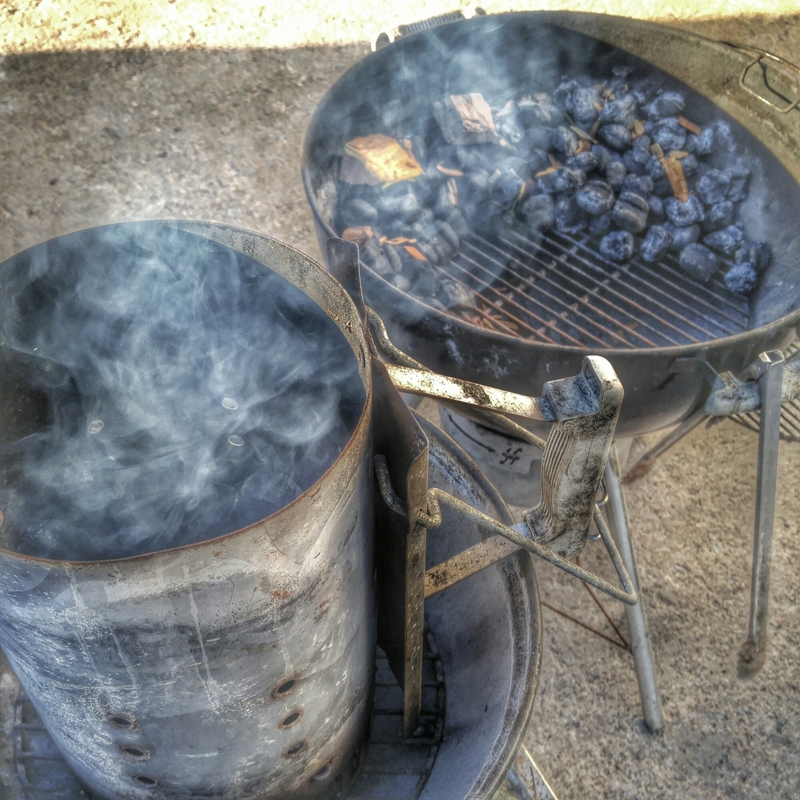 I kept the cone shaped charcoal starter in the middle of the kettle and poured the charcoal around it. 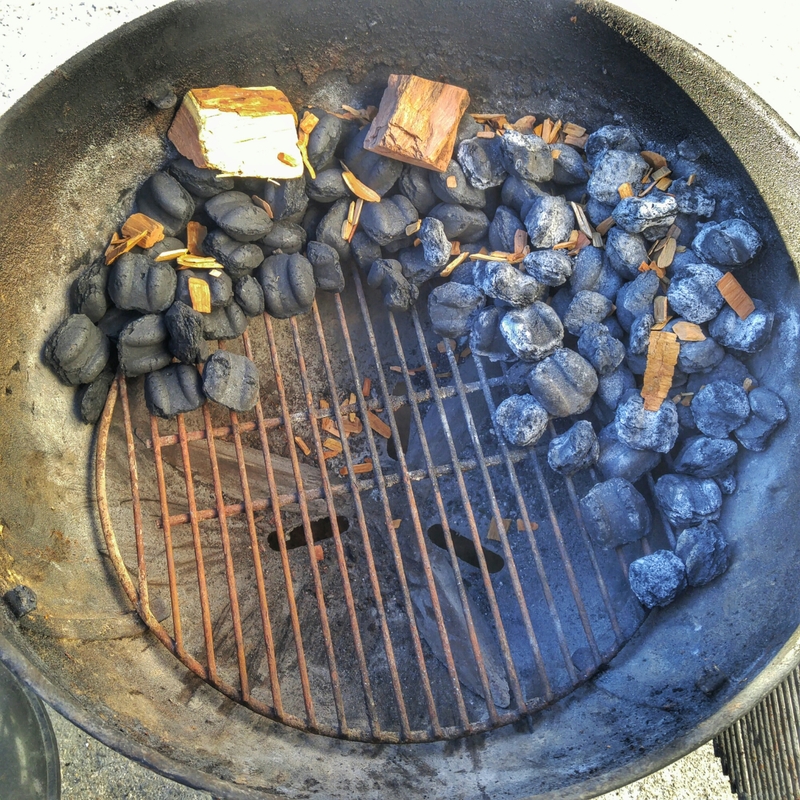 Then sprinkled some cherry chips on top and about four mesquite chunks along the course of briquettes. At the start of the course of briquettes I placed a starter cube and placed the cover on the kettle waiting for the temps to climb to around 250 degrees. While the coals were getting up to temp It’s time to get to work on the pork. 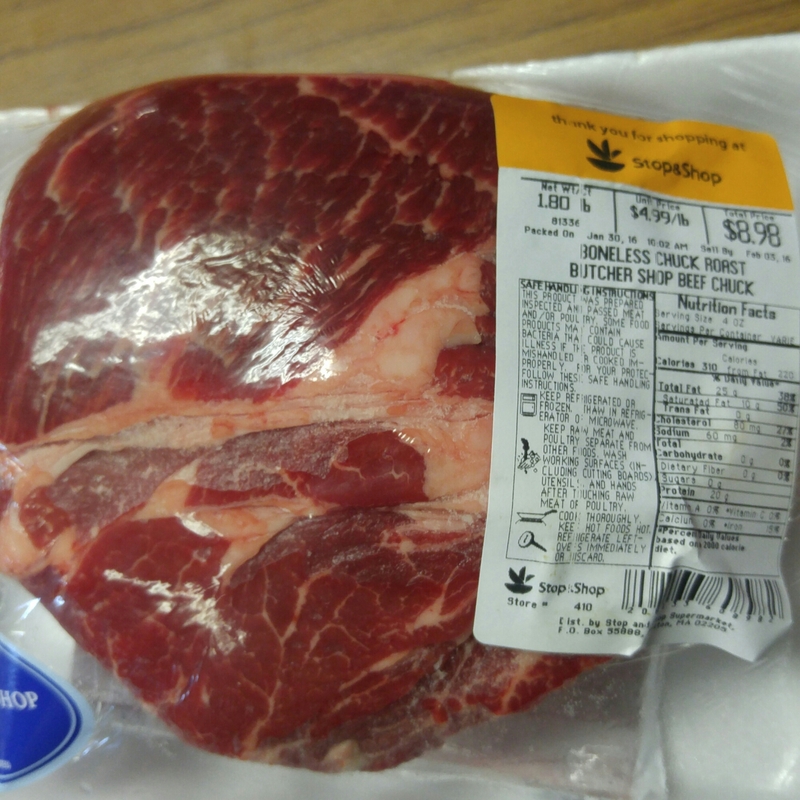 When opening the package the cut up pieces of pork shoulder were still a little larger than I wanted so I cut them into one and a half inch bite sized pieces. I also trimmed off any large sections of fat. Next drizzled them with yellow mustard and tossed them in a large ziplock bag to coat. Next lay the mustard coated pork on a cookie sheet and sprinkle on your rub. My go-to rub happens to be the Paul Prudhomme Magic rub. Once the STOK Charcoal drum is up to temp, on go the rubbed pork pieces. An hour in and the STOK is holding 300 using the snake method like a champ. Internal temp on the pork is 145 degrees. 7:00PM After two hours on the pit the internal temps on the pork are 167. The pork is pulled off and drizzled with a mixture of 5 parts bbq sauce and 1 part apple cider vinegar and foiled. Found this vertical setup interesting. 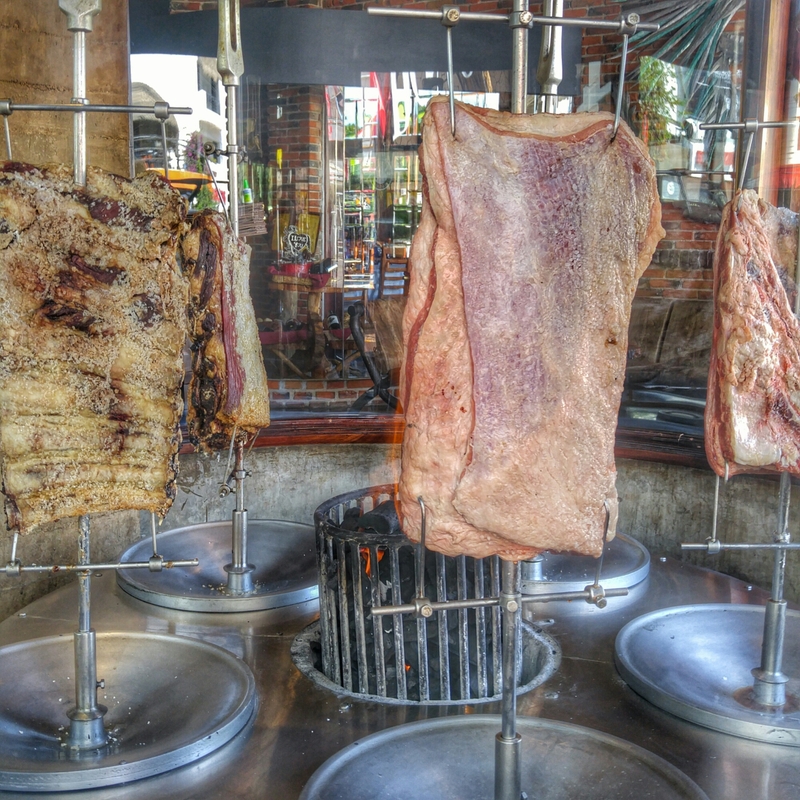 I’d think it would be more apt to self baste in its own rendered fat if it were horizontal instead of the juices sliding down and off of the meat completely in the vertical setup. Must be a reason for it. Seems like a ton of salt packed onto the meat as well. Beautiful restaurant. Didn’t eat there. 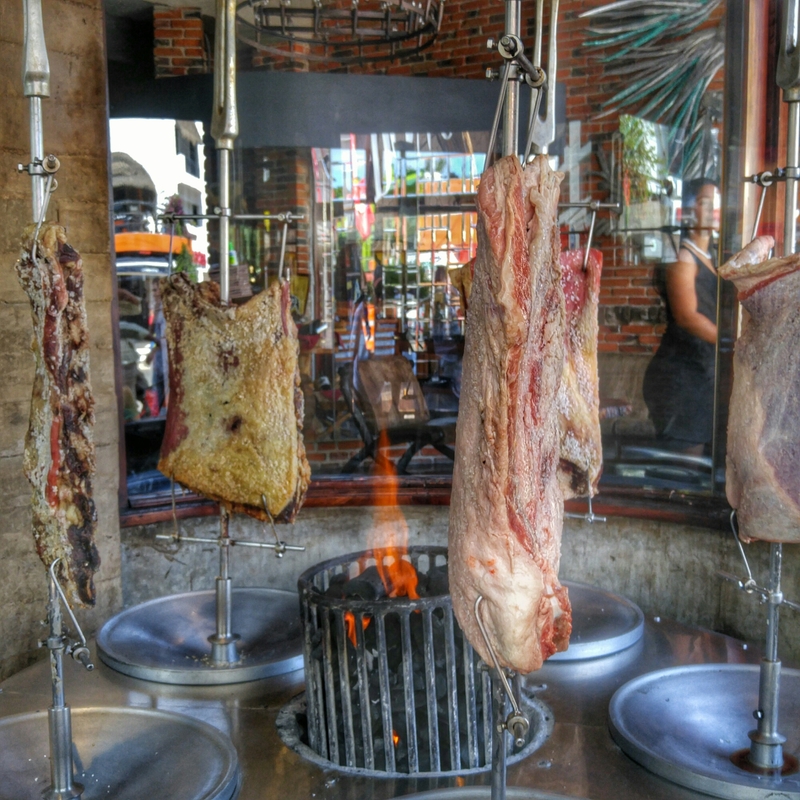 Fire up the pit and leave the charcoal insert in to create a vortex like heat concentrated right under our meat. BBQing with high heat vents wide open and direct. Took steak tips out 45 minutes in advance to bring to room temp and rubbed with evoo and then a liberal seasoning on all sides of Atlantic Saltworks Tuscan Blend. 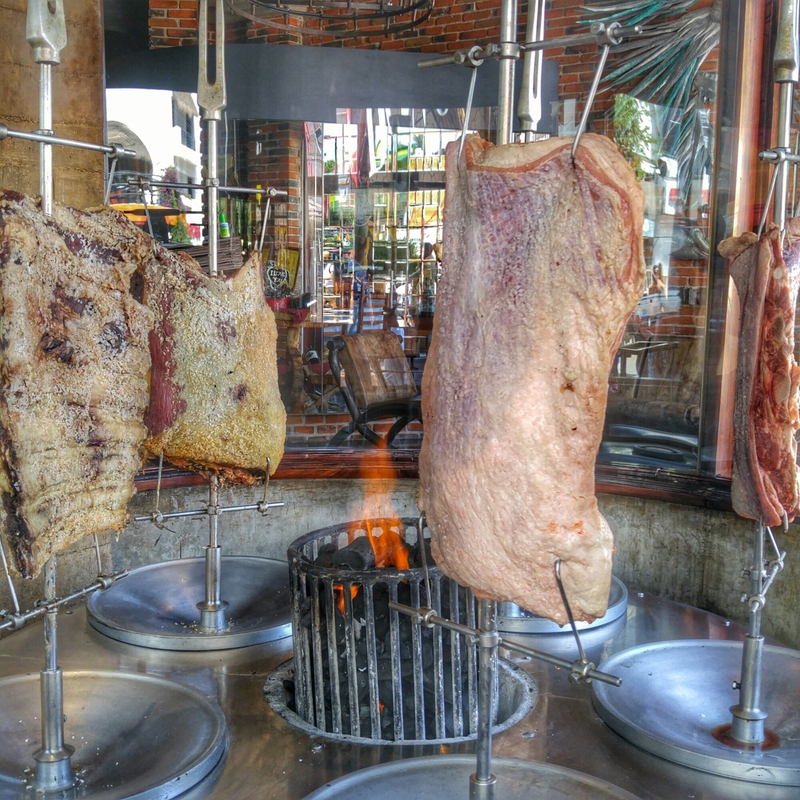 Once the coals are orange fired up hot we place the steak directly over the coals on the STOK Charcoal Drum’s Cast Iron Grates. Can we ali about the sear produced by the STOK concentrating the heat up through the Vortex like charcoal basket and the cast iron grates? Incredible! Larry from http://www.thewolfepit.com has my favorite bbq video series check out his site at the link above for this recipe. Set up the Kettle for the snake method using briquettes, cherry chips and mesquite chunks. Got a third of a chimney going and dumped the asked over coals onto the left end of the briquette “fuse” looking to keep temps around 250 degrees for smoking the beef. 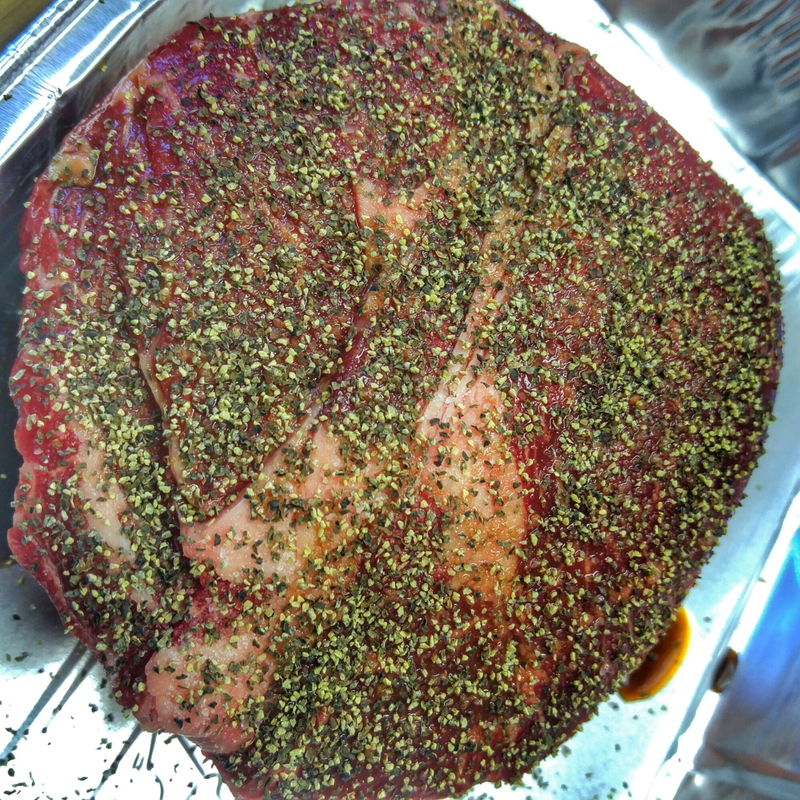 Applied Worcestershire sauce to the chuck roast and then coated with coarse salt and black pepper. Once the pit hit 250 degrees tossed the beef on and inserted the probe. Once the beef hits 165 internal we pull it off the pit and add a half a bottle of cherry root beer and a couple of tablespoons of Worcestershire sauce to the pan with the veggies, plop the beef roast on top and seal it up in foil. Opened the bottom vent on the kettle and will let it braise til it falls apart. After a couple of hours it hit 200 degrees internally but wasn’t pull-apart-effortlessly tender. So I covered it up until I could break it up easily. Once it broke apart easily it was shredded like you would shred pulled pork. Then left for about twenty minutes more uncovered to reduce the liquids even more. When done, piled on top of onion rolls with a slice of pepper jack cheese and some chipotle mayo. Delicious. The guys at the dock all raving about it. Serious heat. 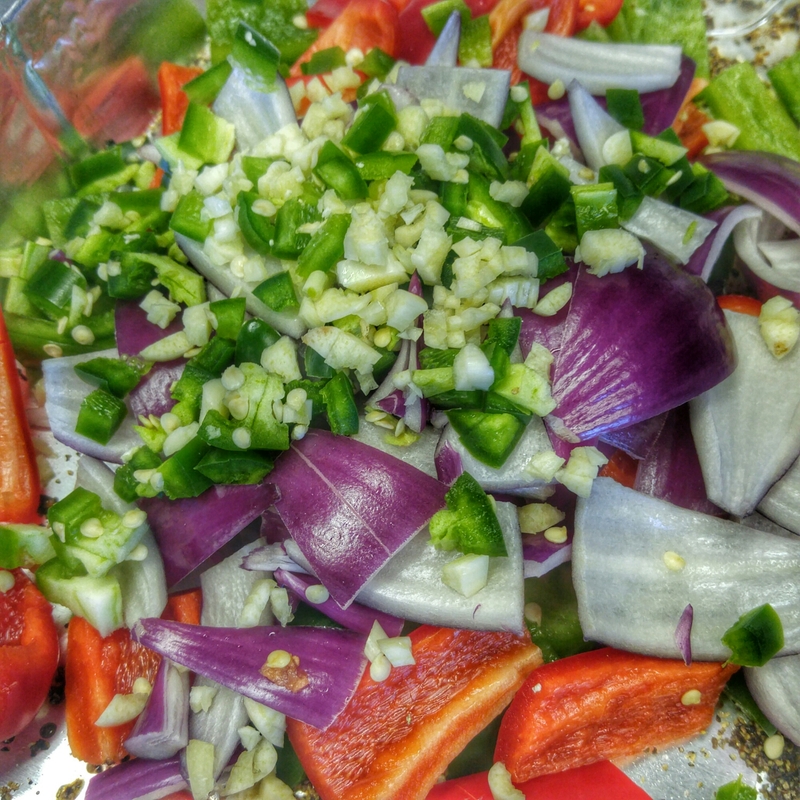 if the people you are cooking for won’t enjoy the heat, cut back on the jalapeno pepper. Thanks To Larry from http://www.thewolfepit.com for the recipe. Check out his site, it’s fantastic!